This stunning space wallpaper shows the Toby Jug Nebula, which is located about 1200 light-years from Earth in the southern constellation of Carina (The Ship’s Keel). More formally known as IC 2220, it is an example of a reflection nebula. 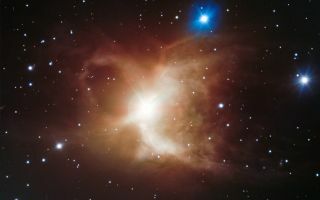 ESO’s Very Large Telescope has captured a remarkably detailed space wallpaper of the Toby Jug Nebula, a cloud of gas and dust surrounding a red giant star. This view shows the characteristic arcing structure of the nebula, which, true to its name, does indeed look a little like a jug with a handle. This image was released Oct. 9, 2013.